Some say that Chickweed is purely an ‘old wives’ tale’ remedy for obesity. But in fact, there’s supporting scientific evidence that Chickweed may indeed be beneficial to weight loss, when included in a healthy lifestyle included proper diet and exercise. Basically, as a mild diuretic containing saponins, Chickweed emulsifies the fat cells and assists them out of the system. In Healing Wise by Susun Weed, it says that Chickweed is an excellent metabolic balancer with a potentially regulating effect on the thyroid. 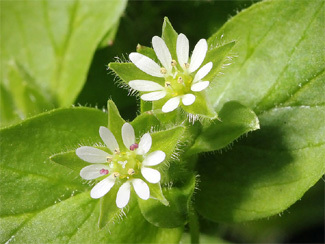 Chickweed was reportedly used at times for food. Chickweed enjoys a reputation in folk medicine for treating a wide spectrum of conditions, ranging from asthma and indigestion to skin diseases. Traditional Chinese herbalists used a tea made from chickweed for nosebleeds. The active constituents in chickweed are largely unknown. It contains relatively high amounts of vitamins and flavonoids, which may explain some of its activity. Although some older information suggests a possible benefit for chickweed in rheumatic conditions, this has not been validated in clinical studies. Often considered a nuisance to gardeners, this inconspicuous small plant grows world wide in abundance. Generally, it’s one of the first plants in spring. In summer it can be found in cooler, damp shady areas. PLUS: It makes a wonderful addition to fresh spring salads! Although formerly used as a tea, chickweed is mainly used today as a cream applied liberally several times each day to rashes and inflammatory skin conditions (e.g., eczema) to ease itching and inflammation. As a tincture, 1–5 ml per day can be taken three times per day. Two teaspoonfuls of the dried herb may be used to make a tea. This may be drunk three times daily. No side effects with chickweed have been reported. At the time of writing, there were no well-known drug interactions with chickweed. Chickweed: The ubiquitous, small, green chickweed plant grows across the United States and originated in Europe. The leaves, stems, and flowers are used in botanical medicine.